John Hills discusses the World Conference on Scientific Yoga Conference program schedule with Dhirendra Brahmachari and Amrit Desai. Dhirendra Brahmachari (12 February 1924 – 9 June 1994), born Dhirendra Choudhary in village Basaith Chanpura, Madhubani, Bihar, was the yoga guru of Yogi Bhajan who taught Kundalini Yoga in the West and founded 3HO. Dhirendra Brahmachari was also yoga mentor of Indira Gandhi – a former Prime Minister of India  He ran Ashrams in Delhi, Jammu, Katra and Mantalai (Jammu and Kashmir) and wrote books on yoga. Inspired by reading the Bhagavad Gita, he left home at the age of thirteen and went to Varanasi. His guru was Maharshi Kartikeya whose ashram was at Gopal-Khera, about twelve miles from Lucknow. Dhirendra Brahmachari studied yoga and associated subjects there. In the 1960s he was invited to travel to the U.S.S.R. as a hatha yoga expert to train Soviet cosmonauts. Jawaharlal Nehru later invited him to teach yoga to his daughter, Indira Gandhi, to improve her health. He became influential politically in 1975–77 when Mrs Gandhi dissolved Parliament, declared a state of emergency and suspended civil liberties. In the late 1970s, Dhirendra Brahmachari promoted the benefits of yoga in a weekly program called "Yogabhyaas" which was broadcast on Doordarshan, the state-owned television network. He introduced yoga as a subject of study in Delhi administered schools, a considerable innovation. He was the owner of Vishwayatan Yogashram in the centre of Delhi, now known as the Morarji Desai National Institute of Yoga. He also owned campuses in Jammu, Katra and Mantalai. He wrote books on yoga in Hindi and English including 'Yogic Sukshma Vyayama' and 'Yogasana Vijnana'. His ashram at Mantalai is spread over 1008 kanals of land with private airstrips, hangar, a zoo and a seven storey building in gandhi nagar, Jammu. 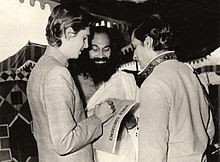 Nowadays there are three known successors of Dhirendra Brahmachari yoga tradition: Bal Mukund Singh from India, Reinhard Gammenthaler from Switzerland and Rainer Neyer (http://www.yoga-shambu.at) from Austria. ^ Deslippe, Philip (2012). "From Maharaj to Mahan Tantric: The construction of Yogi Bhajan's Kundalini Yoga". Sikh Formations. 8 (3). Retrieved 12 September 2018. ^ Tandon, P.D. (21 May 2001). "The truth about Indira". Outlook. Retrieved 1 June 2018. ^ "Speculation rife about Swami Dhirendra Brahmachari's estrangement from Gandhi family". India Today. Retrieved 1 June 2018. This page was last edited on 1 March 2019, at 10:23 (UTC).